Chill stands out. It is not your ordinary picture book for the 3+ age group. At times, the book has sparse text and much of the underlying story is captured in the illustrations. But it is perfect for opening a discussion with pre-school children on important topics such as friendship, fighting and making up, alone time and calming oneself, stress and anxiety, and individuality. Dolly the pig likes to play on her own but some things are more fun when done with other people. Jack Rabbit is her best friend and they enjoy playing together, comparing and competing, and hanging out in their Best Place. One day they paint each other’s portraits and don’t like the way the other has depicted them. They fight and go off in a huff. As anger fades, sadness and loneliness start to encroach. They each seek comfort in doing something relaxing but their thoughts drift to the other. The next day, having calmed down, they each go to their Best Place where they meet, acknowledge their true feelings and start to play. Sitting back to back under a tree, Jack Rabbit says “We’re both chilled now, Dolly.” The book closes with the two friends holding hands and walking off together into the sunset. There is a rawness to this book that touches the heart. Pencil illustrations filled with often subdued colour move across white backgrounds and capture the characters’ feelings. The minimal text leaves lots of room for the reader to fill in the story with details and interpret the implied emotions. 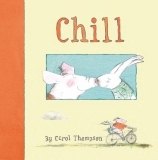 This book is a treasure from accomplished illustrator and storyteller, Carol Thompson.